Despite the Nintendo Switch having gone from strength to strength this year, with the exception of The Binding of Isaac: Afterbirth, there hasn’t really been many roguelikes on the system, which is kind of weird considering how well-suited they are for short play sessions on the go. However, one of 2016’s best roguelikes, Enter the Gungeon, has just arrived on the system, and I think it may have found its best version yet. Is making an enemy that is literally a giant bullet eat lead forced cannibalism? Just curious. 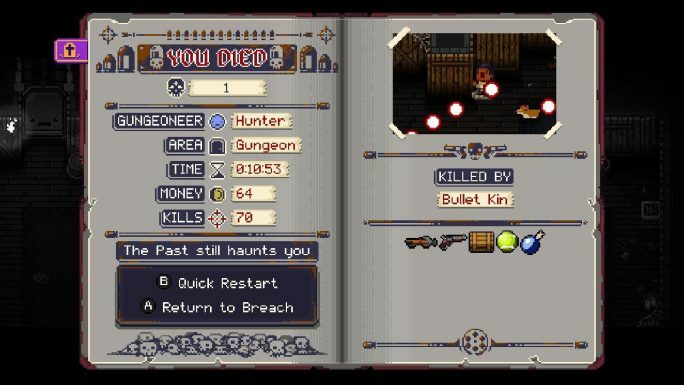 For those unaware, Enter the Gungeon is a roguelike bullet hell game where you play as one of four ‘gungeoneers’, with varying tools and abilities, who is delving into the mysterious Gungeon to find a gun that can change their pasts. There isn’t a lot of exposition here, which is fine, as the amazing art direction and witty item descriptions easily give the game as much personality as it needs to remain engaging. Ever wanted a gun that fires anvils? Enter the Gungeon has got you covered. 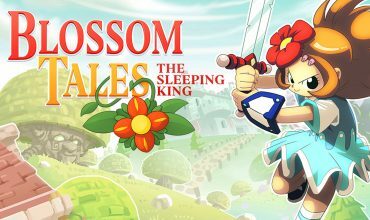 The game itself plays very well on the Switch; performance is good, except for a handful of times where enough projectiles filled the screen to give the processor a headache and dip the frame rate a bit. However, for the most part you can rely on the game’s controls to be responsive. Going from the Steam version, it took a little while to adjust to using a controller, but I found the controls to be pretty natural, and fortunately everything is rebindable if you don’t like the default button layout. What I don’t think I would recommend about this version of the game is the split-Joycon co-op. 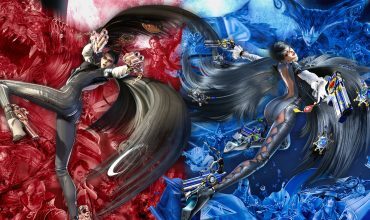 While it is kind of fun in a chaotic sort of way to have twice as many bullets firing all over the place, and there is a benefit to having effectively twice as many hit points, the Joycons themselves are too small, and there are not enough buttons to remap all of the controls well, so what is already a pretty difficult game becomes practically impossible to manage with two players using the tiny controllers. As per roguelike tradition, every time you die, you start from the very beginning, and this is a game that does not mess around, so you will likely be seeing the death screen many times before making significant progress. I do wish that the game made accruing permanent upgrades a simpler process, as the simple act of unlocking shortcuts so that you don’t have to go through the first level every time you die is needlessly difficult. Incidentally, this is the death screen. You’ll be seeing this a lot. That said, if you are a Switch owner looking for a fun indie game to keep you hooked for a long time, I think you could do far worse than Dodge Roll’s Enter the Gungeon. 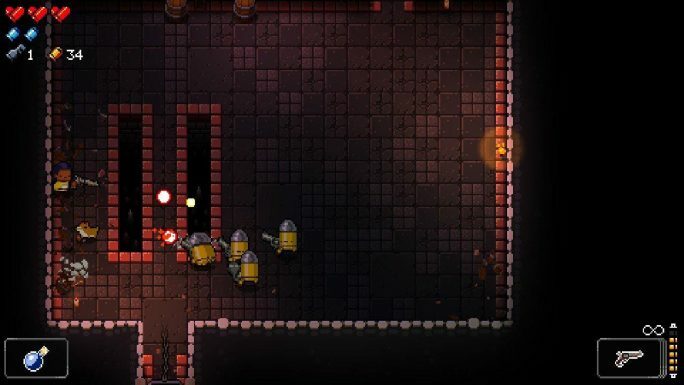 Whilst it still has some balance issues (sometimes you can get up to the first boss without acquiring any new guns and get stomped into the dirt, and others you can find a great gun and face little challenge), and the path to unlocking permanent upgrades and shortcuts is way too roundabout and obtuse, the Nintendo Switch is perhaps the natural home for Enter the Gungeon, and I am having a great time. So, if you are looking for an enjoyable and engaging, albeit hard as nails, indie title to play on the Switch, or are an Enter the Gungeon fan who would like to play it on the go, then I couldn’t recommend Enter the Gungeon on the Switch enough. Well, what more could you want? 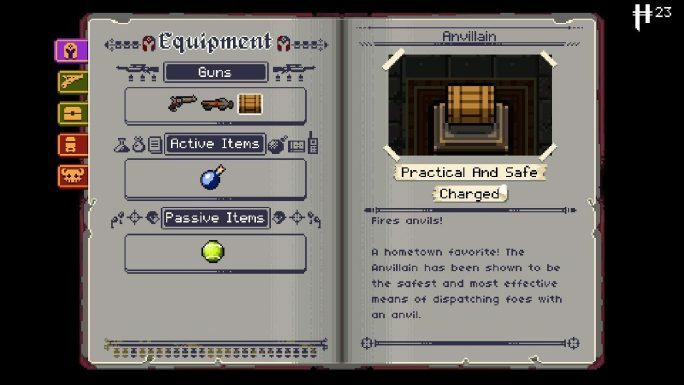 It is all of Enter the Gungeon, one of 2016’s best games, on the Switch, and the port is every bit as enjoyable as the other versions. Split joycon co-op is fiddly and overly uncomfortable to play, and the game’s high level of difficulty may turn a lot of more casual gamers off, but for those of you keen for a meaty challenge, Enter the Gungeon on Nintendo Switch may be just the game you were looking for.